Models, mannequins and many different outfits: these are the main ingredients of this semester’s LdM Fashion Show. 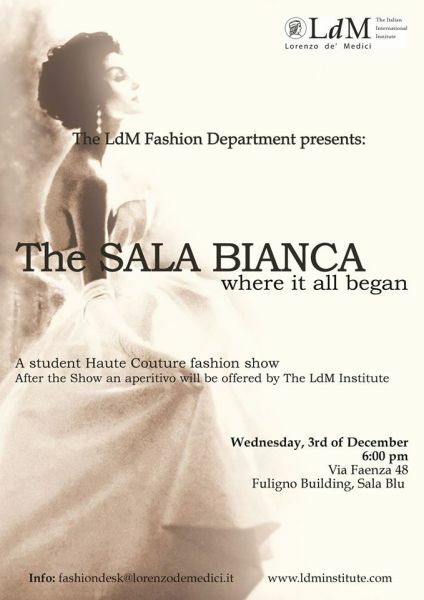 Inspired on the atmosphere of the Sala Bianca in the Pitti Palace during the 1950s, it will be the big moment for our Fashion Design students to show the public what they have been working on during this Fall 2014 semester. The Haute Couture catwalk, starting at 6 PM in the “Sala Blu”, will also serve as the perfect opportunity for the students in Prof. Gianluca Maver’s Digital Photography class to put in practice all the things they have learned throughout their course. After the models have showed all designs and the last photograph has been taken, an aperitivo will be offered in the Foyer from 7 PM onwards. The Fashion courses involved in this glamorous event are Patternmaking, Sewing Techniques, Draping II, Apparel Construction, Knitwear and Fashion Illustration I.